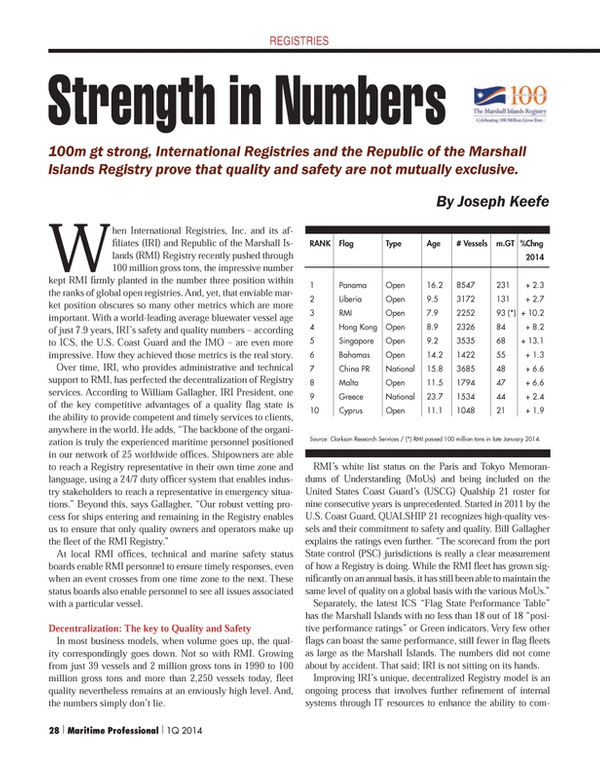 100m gt strong, International Registries and the Republic of the Marshall Islands Registry prove that quality and safety are not mutually exclusive. When International Registries, Inc. and its affiliates (IRI) and Republic of the Marshall Islands (RMI) Registry recently pushed through 100 million gross tons, the impressive number kept RMI firmly planted in the number three position within the ranks of global open registries. And, yet, that enviable market position obscures so many other metrics which are more important. With a world-leading average bluewater vessel age of just 7.9 years, IRI’s safety and quality numbers – according to ICS, the U.S. Coast Guard and the IMO – are even more impressive. How they achieved those metrics is the real story. At local RMI offices, technical and marine safety status boards enable RMI personnel to ensure timely responses, even when an event crosses from one time zone to the next. These status boards also enable personnel to see all issues associated with a particular vessel. In most business models, when volume goes up, the quality correspondingly goes down. Not so with RMI. Growing from just 39 vessels and 2 million gross tons in 1990 to 100 million gross tons and more than 2,250 vessels today, fleet quality nevertheless remains at an enviously high level. And, the numbers simply don’t lie. Separately, the latest ICS “Flag State Performance Table” has the Marshall Islands with no less than 18 out of 18 “positive performance ratings” or Green indicators. Very few other flags can boast the same performance, still fewer in flag fleets as large as the Marshall Islands. The numbers did not come about by accident. That said; IRI is not sitting on its hands. Quarterly meetings of the MSG are aimed, in part, in improving the RMI duty officer system. In place since 1991 on a 24/7 basis, the program was, at one time, solely U.S. based. Not anymore. With offices in Asia, the Middle East, the U.S. and West Coasts, ship owners and classification societies can call at any time with any problem. At RMS, it is no accident that all bluewater tonnage is IACS classed. Bill Gallagher, for good reasons, wouldn’t have it any other way. With more regulations in the pipeline and a corresponding increase in PSC inspections, the importance of working with a reputable ‘class’ society will increase. Cost is of course a major consideration, but ensuring that a ship is safe and compliant will in the long run save owners time and money. IRI maintains that its intent has never been to be the largest Registry in the world, but instead the choice of flag for quality owners and operators. IRI defines a quality shipowner/operator as one that takes marine safety, security, environmental protection and social responsibility seriously. Gallagher insists, “We have owners who will lay up a ship even when there are commercial pressures as they look at those three elements and do the right thing.” In turn, though, he knows that owners are also vetting the Registry with their own criteria. The numbers say that they like what they see. Pointing to the 25 RMI offices spanning the globe today, Gallagher summed it up for MarPro: “100 million tons is nice, but we’re not going to rest on our laurels. Because the business can’t be run exclusively from the United States anymore, our expertise is truly international. First and foremost, we’re a flag state administration and we’re not involved in any other ancillary businesses. Along the way, we’ve changed the type of people that you bring in to run a registry. You need banking, finance skills and legal savvy, just as much as you need the operational and technical expertise. We’ll keep innovating. A big job is to recruit people who have the expertise that can replace the current generation of flag state people. We’re doing that. And, it appears to be working. There IS strength in numbers. Who knew?